Under pressure from the FTC, Aaron's agreed to stop tracking and webcamming customers through rented computers. The Federal Trade Commission reached an agreement with Aaron's Inc. to block the product rental company from secretly tracking customers who rented computers, including the surreptitious webcamming of "intimate activities." 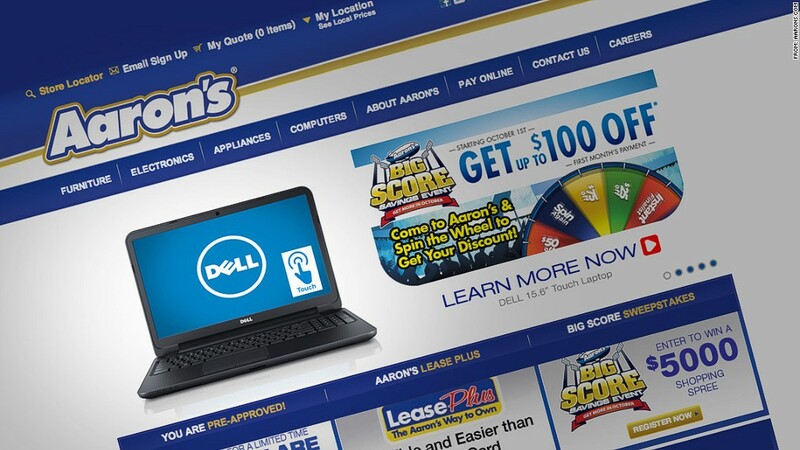 The FTC said that Aaron's (AAN), an Atlanta-based chain of about 2,000 company-owned and franchised rental stores, rented out computers installed with software known as Detective Mode. This allowed the company to track the renters' data through keystrokes, screen shots and webcam images, the commission said. "Detective Mode's surreptitious capture of the private details of individual and family life -- including images of visitors, children, family interactions, partially undressed individuals, and people engaged in intimate conduct -- cause actual consumer harm," read the complaint that the FTC filed earlier this year. The complaint also said that the secret data gathering placed consumers at risk by exposing financial and medical information through screen shots containing Social Security numbers, and bank and credit card statements. The software was not detectible to computer users, and renters could not uninstall it, according to the complaint. Aaron's is prevented from using location-tracking technology to obtain information about renters without their knowledge, according to the consent order. The company is also required to destroy all consumer data already obtained through its "deceptive" means. When asked if Aaron's installed the software to track stolen computers, company spokeswoman Garet Hayes replied via e-mail: "Due to pending litigation, we are unable to provide comment at this time."